I have gotten several different things now and then that friends I’ve made in the blogging world have listed me for some characteristics or to in some way highlight what I do here on my blog. I haven’t paid many of them forward because well, it doesn’t fit. 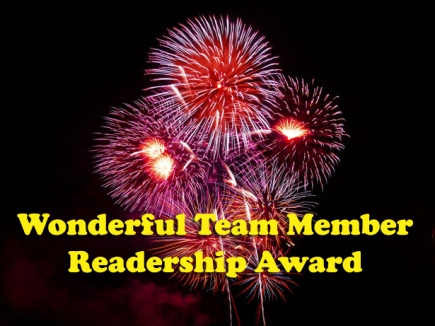 I love getting into adventures and sharing them, I’m not a fan of patting myself on the back, but then along came Julie at Sleuth4Health saying I got a Wonderful Team Member Readership Award. Sure, someone simply made it up (and it appears it has been floating around a bit for a year or so), but this is a chance to celebrate teammates, whether they know I consider them part of the team or not. I really enjoy celebrating people who rock so I am paying it forward by saluting some of the people in my blog community. The nominee shall nominate 14 readers they appreciate over a period of 7 days, all at once or little by little; linking to their blogs; and telling them about it at their blogs. The nominee shall name his/her Wonderful Team Member Readership Award nominees on a post during 7 days. I have to admit, I am going to disagree with rule number 3… well I sort of disagree with them all. I’m not writing this so others will do something and requirinng people to say thank you is something I got away from YEARS ago. The people I list here don’t need to do anything in return, well, I guess that’s unless they want to. They already are awesome people who are so supportive so they can simply keep being themselves. For me, blogging is a really individual effort so what fits for me doesn’t always fit for others. That’s fine. I just wanted to take this opportunity to tell some people who have been great members of the team thank you. My mom. She doesn’t comment on the blog very often, but she almost always reads it and supports me on Facebook, in person, etc. I’m pretty freakin’ lucky there. Susi Kleiman (twitter’s @bocafrau) who frequently offers encouragement for some of the things I tiptoe into. She writes her thoughts and what’s happening in her part of the world (South Florida) at bocafrau.com. I’m still not sure how we found each other but I am sure glad we did cause Susi rocks! It helps having folks who know a lot about what you are blogging about on your team. Marjory Walker has offered lots of support — moral, informational and anything else! She’s in the cotton business personally and professionally so she is a great adviser when I have questions! Mona is a blogger in the Pacific Northwest that I think early on wasn’t sure what to make of me. A little skepticism and questioning helps me think through things though and in the process, I think we’ve both found we had more common ground than the surface would show and in the process we found great support for each other. She blogs at http://upcafe.wordpress.com/ and you should check her out, especially if you are interested in local food in Washington state. Sarah is an elementary school teacher in Sacramento, CA who not only has commented she’s sent me guest posts and asked me to help her class learn more about cotton. Who could say no to that? Not me! She blogs at houseagbuilt.blogspot.com and you can see what’s she’s up to with teaching, at home with her new hubby, etc. Ryan Goodman, the cowboy who figured out how to get people to share the stories of how agriculture proud they are. I’ve written guest posts for him a couple of times and he comments here now and then, but we probably text more than anything. We even came up with the idea of blogstorming by talking at a Nashville hotel once. Elaine Shein is another one who stays lowkey in her public support of my blog but unwavering in her quiet support helping me think about photos on a regular basis and helping me celebrate some accomplishments now and then. Val Plagge is one of the farmers I’ve gotten to know since I started blogging. I think we first met at a conference in Nashville but since then we’ve caught up with each other multiple times online and in person. She’s a busy mom blogging about their family and farm at cornbeanspigskids.blogspot.com/. Katelyn Rumold started showing up on my blog a year or so ago and later when I met one of her coworkers, he described her as my social media stalker! LOL! That sounds far scarier than a Midwestern farm girl who moved to St. Louis for a job and simply saw some paralells. She blogs at midwestfarmgirl.com so feel free to check her out! For quite a while, Bruce Sallan was my most prolific commentor. Bruce is a handful I met through #blogchat and later I participated in his #dadchat despite not being a dad LOL! We don’t catch up as often as we used to, but Bruce has definitely remained a member of my team. There are several Midwesterners there, and I want to be sure that folks know Southerners are an equal part of the team too. Cotton Boll Conspiracy, while it sounds like it may be topically related, he writes a wide range of topics. And now and then, our paths cross to talk cotton! Jan Hoadley is another southerner who not only encourages me on my blog, but is busy writing two of her own blogs Slow Money Farm and Slow Money Food! took the most creative photos with my nephew’s Flat Stanley too years ago…. he still talks about it! Michael Wojahn is the Minnesota Farmer behind minnesotafarm.wordpress.com who found me early in my blog’s history and has always had a kind word. I subscribed to his blog all those years ago too and his regular updates help provide me a push now and then to create my own content. And I feel like I should mention I have previously done shoutouts to several folks who have rocked my blogging world during my social media heroes series. The two that have most helped on the blogging front are Mack Collier founder of #BlogChat (LOTS of awesome support there! Too many to mention!) behind a self-titled blog, farmnwife Judi Graff who does a great job encouraging the ag blogging community and the cubicle chick Danyelle Smith who started Show Me the Blog which was a great welcome for me to the St. Louis blogging community. Thanks everyone both on this list and who I just didn’t have a chance to include. There are so many great folks who have made blogging so much fun that I’m still at it more than three and a half years later. I would never have had the motivation to keep it ups without such awesome people supporting the blog! Janice, thank you so much for this Award! You are so kind to even consider me for it. Such an honor, which I hope i deserve. Best wishes for continued success. I’m still blown away by the kind words you have for my efforts at blogging. It is the chance that people like you will actually read what I write that keeps me going. This Minnesota Farmer is proud to do his small part to tell the story of agriculture. Thanks for the mention! I always look at your blog to see what I can adapt that fits! Usually not quite in the same way, but am in good company. Yeah, not much straight copy & paste, but lots of ideas that can be shared. Are you sure your REAL name isn’t Janice PEOPLE! I “stumbled upon” your amazing site after googling “what is cotton?” I really know what it is but a friend and I are doing flowers for a wedding rehearsal dinner at a restaurant in Charleston, SC, called “High Cotton”. We will be using the various stages of cotton in the arrangements and thought the northern guests might enjoy a little history of cotton especially since they will be receiving a stem of cotton as a favor. Anyway…all this to say…I love your website! I am amazed at your diversity of knowledge and interests and wonder how in the world you, all by yourself, do it all! Thanks for such a lovely and infomative site Janice! Thank you so much for the kind words! I would really love to have some photos after the wedding where I can share how cotton sometimes plays a role in weddings. I have thought about it before but never seem to get the photos & all together. If you and the bride & groom family are interested, please let me know! And PS — It may surprise you, but I have been to High Cotton! Loved the she crab soup! Janice, I’m embarrassed to say that I JUST saw this many months after the fact but it’s never too late to say that I have enjoyed your blog and making your acquaintance, both on and offline. I hope we can continue to stay in touch. Keep up your great communication with the world at large. You have a real gift.